This can be a subjective subject, but this is what's worked for me. I've played Les Paul's for around 40+ years (amongst many other brands). There are a lot of new Historics on the market that could really benefit for just small inprovements. Seems like Gibson gets about 80-90% there and then drops the ball. I'll start with the tuners, bridge and tailpiece. Tuners: the Kluson replicas they use are decent, but I always like to know if a set of Grovers would sound better. sometimes the mass you ad at the headstock can really improve the overall tone. I have a thing called the "Groove Tubes Fat Finger". It's basically a U shaped piece of brass that screws down to the headstock. If it improves the sustain then I know adding Grovers will help. If there's no difference then I'll leave the Kluson's. BTW, I usually buy Grover's from the late `50's or `60's vs. new ones. New ones are made in Asia and are made out of a different alloy/metal than the old ones. Grover has not made any tuners in the States since 1977. You can usually find them for a reasonable price on Ebay. (say between $50.-$95.00). Stoptail: Fifties Gibson's used aluminium tailpieces and Steel studs and steel bushings. Gibson these days uses nickel plated Brass stud and Zinc stoptails. Zinc does not do your tone any wonders. There are many sources for aluminium tailpieces. Historics come with aluminium. The studs are usually crap though. My suggestion is to buy the set from Pigtail. 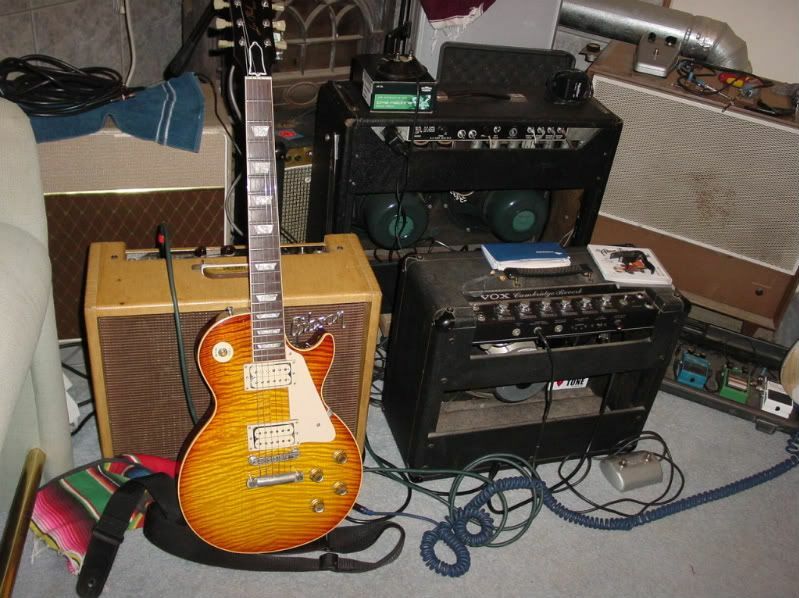 His studs, bushings and stoptail are exact the same as what Gibson made in the `50's thru mid `60's. Aluminium resonates, zinc & brass don't. What you want is materials that transfer the string vibrations to the wood without causing any damping effect. ABR-1 bridges and posts: well.. here's a biggie. Gibson used zinc ABR-1's and nickel plated 1" brass posts. while this worked great with the high quality of wood Gibson was able to buy in those days, the wood now is hit or miss. The Custom shop has weight regulations for mahogany for backs and necks. USA Production doesn't.. Custom also uses selected Honduran Mahogany since 2003. although it's not exactly the same stuff that was used 50 years ago. Gibson does contribute to farming hardwoods, but alot of the stuff that they get now is either stumpwood or old stuff that was passed over back then. either way it's much better sounding wood that what they were using. Honduran Mahogany was used extensively for making furniture for centuries and Gibson used Furniture Grade Mahogany because it looked good and really sounded great. Anyway.. bridges.. with the lower quality wood used, the standard brass posts, zince ABR-1 base and brass saddles really don't help the tone. What I've found is that replacing the 1" brass post with either a 1.5" or 2" Stainless Steel 6/32" posts really transfers the string vibration and as well gets the transfer point down lower into the wood. What this does is improves clarity and sustain as you're letting more of the wood transfer the vibrations. Now you and experiment with this. The 6/32" stainless screws only run about .35 Cents per screw. so you can try a 1.5" or a 2" and see what each one sounds like. On my `02 R-0 I've got one of each. Bridges & saddles: Like I said.. zince doesn't sound very good. I've found that the machined aluminium ABR-1 from Pigtail sounds great, especially if you have a dark or semi-dark sounding guitar. It's like having an aluminium wrap around tailpiece on your Lester. I know the folks at Callaham are coming out with a Stainless Steel machined ABR-1 very soon. this should really be a great improvement! Now we only have the choice between zinc or aluminium. Saddles: traditionally they were yellow brass. That's great for a bright guitar, but the titanium saddles from KTS sound incredible. Very smooth, loads of sustain and an improved note clarity and harmonics. Anyway, the thing is experiment with your guitar and see what sounds best to your ears. Part #2 will deal with electronics and caps. Incredible info Don. Thanks. I have a 1999 Gibson Historic Les Paul that is incredible. I'm afraid to change anything in case I ruin it. I like the idea of changing the bridge. My friend Tommy at The Music Zoo swear by the RS cap upgrade. I look forward to part two. Great post Don. You have me wanting to fool with modding the gold top now. Propaganda is a soft weapon; hold it in your hands too long, and it will move about like a snake, and strike the other way. Hell, you got me wanting to buy one just so I can mod it. I work with titanium in the race car business, and I once made a guitar slide out of it thinking it would sound awesome. YUK, it was the thinnest, tinniest sounding slide I had ever used. Not enough mass I guess. I am surprised they sound so good used as saddles. Yeah, that use to be my conception as well.. I have a Titanium stop tailpiece on one guitar and some saddles on another. It really opened up the clarity and added depth to the guitar. I would have thought it would be pingy..
body not Honduran..a very resonant 7.14 lbs. Serial number 001 , 1996 Namm R0. Epidrake, go for it..you wont be sorry, I promise you. I think we're done ...except for just one thing... SOUNDS like a 50 year old time machine.. THE GUITAR IS "SPEAKING TO ME" NOW...I GOTTA GO! Last edited by Greggman on Mon Jul 20, 2009 7:09 pm, edited 1 time in total. Nice Greg!! Thanks!! BTW, how do you like the Vox Time Machine? It really is a beautiful guitar. Enjoy it. Don Butler wrote: Nice Greg!! Thanks!! BTW, how do you like the Vox Time Machine? Returned it...dont need it and the Hughes Kettner Replex eh? TECH 21 Sans Liverpool..on he way. "If you dont know where you're going, anyroad will take you there"
You will love the Tech 21 Liverpool. Analog heaven. Bring it by when you get it!! Certainly will , UPS says the 27th on the pedal. My friend Ray demos stuff for Tech21 and I got to hear it in my studio. That pedal can do anything from chime to heavy metal. Some great Queen tones too. 7.14 lbs for a Les Paul? Carumba that's light, is it chambered? Have you tried the TonePros Klusson replicas? I like the set that came on my Don Grosh set neck so much that I upgraded both my '88 Pre-Historic Flame Top RI and my CS-336 with them. The have a smoother, more positive feel than the stock tuners and the buttons are a nice rich buttery cream color - not the nasty snot green of the Gibson tuners. I can't say I noticed a change in tone/sustain, but they just feel so smooooth tuning I'm very pleaased with the upgrade. Welcome GuitArtMan! Thanks for the info. Thanks for the info Don! I read somewhere that tonally titanium is closer to brass than steel. The Titanium stop has a bit more resonance and sustain than the aluminium one. works great on this guitar. however, I doubt if it would on all guitars. My R-7 Custom has 2" ABR-1 Stainless Steel pots, an aluminium Pigtail ABR-1, Steel studs and a Montreaux stoptail made from the exact grade/type of aluminium as the originals in the `50's. All aluminium is not the same. There are many grades and types. I once owned the first Travis Bean Guitar and the neck was made from Reynolds T-6061 aircraft aluminium. every grade of aluminium has it's own sound. Don Butler wrote: The Titanium stop has a bit more resonance and sustain than the aluminium one. works great on this guitar. however, I doubt if it would on all guitars. My R-7 Custom has 2" ABR-1 Stainless Steel pots, an aluminium Pigtail ABR-1, Steel studs and a Montreaux stoptail made from the exact grade/type of aluminium as the originals in the `50's. All aluminium is not the same. There are many grades and types. I once owned the first Travis Bean Guitar and the neck was made from Reynolds T-6061 aircraft aluminium. every grade of aluminium has it's own sound. Exactly, which would account for the differences heard with "lightweight aluminium" tp's of different brands (apart from the slight difference in weight i guess). At the mom i have the Pigtail in my R9 and AFAIK it's alum grade is to spec... thanks Don! Welcome back sapi! I LOVE my R57 but it sounds so good and even after all these years, I'm still afraid to touch it. Yes, welcome back. Don't be a strangler.